As the SA handed me a blotter on which she'd just sprayed the scent, I asked her to remind me what the idea was behind this new release. "Oh, it's a gentle, delicate reinterpretation of the original Opium," she gushed. "The concept was to take the familiar ingredients and make them lighter, fresher." "It's got tons of orange blossom in it," she continued. 'Not likely,' I thought to myself. "And a really strong dose of jasmine." "And the base is pure Indian sandalwood." "It was released last year to tie in with the 20th anniversary of Opium." That was the point at which I had to stop biting my tongue. "Sorry, what was that?" 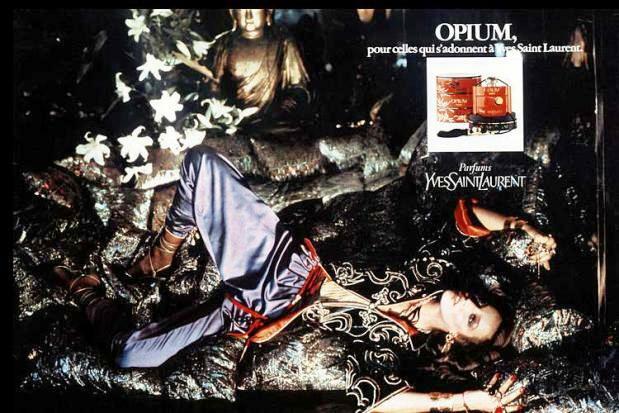 "It was released last year to mark the 20th anniversary of the original Opium." I looked over my shoulder, just to make sure I hadn't been zapped through a time warp. All around me was multi-coloured junk bearing the London 2012 logo. No time warp, then. "Err... Opium is from the seventies." There was a moment's silence. Somehow, her smile managed to grow both wider and chillier. There was a look in her eyes that seemed to say, 'Look sunshine, don't give me any trouble. Am I wearing the YSL badge, or are you?' She cleared her throat. "Oh no, sir, Vapeurs De Parfum was released last year for the twentieth anniversary of Opium. Which means Opium cannot be from the seventies." Our gazes locked across the Touche Éclat tester stand. I considered whipping out my phone and showing her that every single semi-respectable perfume site in the world would confirm that she was utterly wrong. "I'm not going to argue with you," I whispered, "but Opium is definitely from the seventies. In fact, it was widely considered to be one of the finest scents of the seventies." I paused. "Before people started messing around with it." And then I forced myself to look away, turn around and head for the nearest exit. Do they invent these things on the spot? Ines, I know what you mean, but I often enjoy chatting with the SAs. Laurinha, thank you. I'm sure we could all share interesting, shopping-related stories. Ronny, no the maths doesn't work, but hey, who's doing sums, right? Wow. Just.... wow. She seriously claimed this came out in 1992? I'm constantly amazed at how little some SA's know. It's always such a pleasurable surprise to talk with one who's well-informed. I had an experience at with an Estee Lauder badged SA who insisted I couldn't smell more than three scents in a raw and desperately needed the coffee beans... I made a complaint as ignorance and arrogance combination is not the best quality for a SA. AromaX, thanks for sharing. The coffee beans thing irritates me too. I'm sure no perfumers ever inflect them upon their noses when composing. Well that picture of Rupert Everett Holly has in an old Vogue is 1970s . I guess the two came out around the same time . I wasn't a fan then but am now. I havn't found an S.A yet who knows squat-didly about the fragrances they sell.Angie Cox. Angie, there are plenty of excellent Sales Assistants out there... and for all I know this particular one may have been superb in all other respects. She just needs to get her facts straight about Opium. Enough with hassling the SA's. I am unfamiliar with John Lewis but it sounds from your description like a large "mid-level" department store. Your Sales Associate probably was some nice lady trying to support her family. Perhaps she was a dedicated school teacher in need of extra income with a part time job. Her training probably consisted of reading a brochure, or website by the manufacturer. If because of your passion and training you know more than she does, than you don't really need to her ask her questions. Anon, thanks for your comment. I don't think I hassled the SA at all. And yes, I admit that sometimes, I feign some ignorance in order to make it easier to strike up what usually turns out to be an enjoyable conversations with a Sales Assistant, but this time, my question was genuine. I really did want to know the 'point' behind the new Opium flanker. I can't help but smile at the idea of a British teacher having the time to take a part time job. Most I've come across are already working 60 or 70 hour weeks with all the extra paperwork the government now requires. My experience of SAs who don't know their brand is that is often agency staff who are brought in at short notice when the normal counter staff are off for whatever reason who don't know what they are talking about. That's a resourcing issue which is the fault of the brand and if her training does consist only of reading a brochure then that's also the fault of the brand. Anon is being unfair and frankly rude. And to be honest, I actually do expect more from people who work in John Lewis than in other stores. I have some experience of the education world myself, so yes, I did wonder about the likelihood of a John Lewis SA being a teacher as well. But I know that in many other countries, teachers have to take on other jobs to supplement their main income. Personally, I don't think we can expect Sales Assistants to know everything, but I do think we can expect what they DO know to be accurate. I can see both sides of this. I'm fortunate enough to have the extra time and the broadband connection that allows me to research any scent, top to bottom, within minutes. The SA may not be. Having said that, I don't believe I've ever met an SA who knows anywhere near what I know, and don't expect them to. Their job is to sell something, within the parameters of what they're told about the product they're selling. Period. So I usually don't engage them, which means that 1.) they aren't embarrassed or angered; and 2.) I get out of the store a lot quicker. Olfacta, I think I can see where you're coming from, but even though I often like to research perfumes on the Net, I also enjoy interacting with Sales Assistants. So I hope I never reach the stage where I feel I can't ask any of them any questions. What I find irritating about this is that obviously nobody checked whether this SA had the facts straight before she started selling the stuff. If I were selling anything, I would expect the bosses to test me on the sales pitch at least once - after all, bad information gives a bad impression. (And it could make me look stupid, too). They owed it to her. Dear Persolaise- thanks for this. *LOL* Great self control . I have to say when in Neiman Marcus - the first thing SAs push on you is Quelque Fleurs by Houbigant - it must be more than coicidence because it has happened far too many times in different places throughout the recent years. Mimi, how odd. Perhaps they're on 'special' Houbigant commission? I had a similar issue at Bergdorf over the weekend with two different SAs... It's very sad. M Yang, unfortunately, I'm sure this sort of thing happens all the time. Inflexible SAs are the pits, hope it doesn't put you off chatting! I think expecting SAs to know their stuff isn't unreasonable but rather a sign of respect that indicates you take them seriously as professionals. Still, what would have got to me was not so much the fact that she was ill-informed, but her absolute refusal to contemplate the possibility that you might be right and she wrong, and her hostility at being corrected by a potential customer. This does remind me of an experience I had at Heathrow Duty Free, when I was told by a Dior sales assistant (a guy, who looked more like he should be serving in Footlocker and had just lucked into his current vocation) that Dior Homme Intense was "a milestone in mens fragrance". When I asked why, he told me it was the very first EDP for Men. "Really, the very first?" I replied. Fortunately, shepherding the snot nosed oik over to the Guerlain concession to show him the error of his ways didn't waste too much shoe sole. Anon, that's a great story... and 'wasting shoe sole' is a wonderful expression! Anon, I'm sorry you've had unpleasant experiences at HN. I don't go there often enough to comment, but I can't say I've been overly impressed by the service there. A great deal probably depends on which brand's counter you visit.